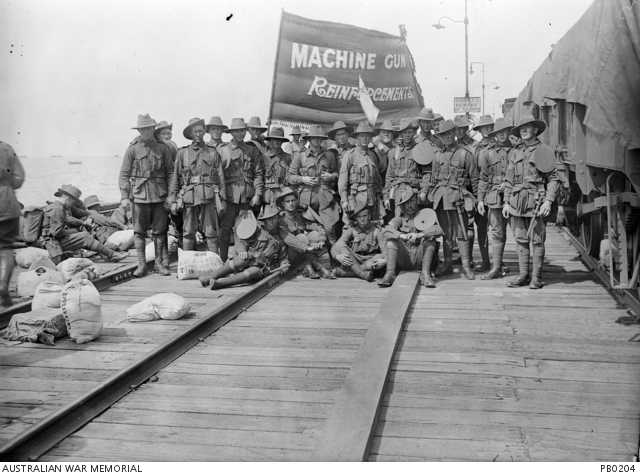 A group of members of the 9th Machine Gun Company, 7th Reinforcements, standing on the railway tracks, near covered train wagons, prior to boarding the troopship HMAT Ballarat (A70). There were 22 members detailed on the embarkation roll for this group of reinforcements and all are possibly included in the photograph. Identified standing, second left is 497 Private (Pte) Henry Ernest John Ashby, of Balmain, NSW and the kitbag belonging to 503 Pte Alfred Frogatt of Scarborough, NSW is on the wharf in the extreme left foreground. There is a large banner in the background with the words ‘Machine Gun Reinforcements’.